Do you need to precisely dispense amounts of liquid for your preferred beverage? If so this could be the pump for you. This is the Bartendro Dispenser from Party Robotics, an ingeniously designed peristaltic pump and controller that can be used to dispense liquids with milliliter accuracy and can be used in a stand alone system or with a router and other pumps for a more complex liquid dispensing system. 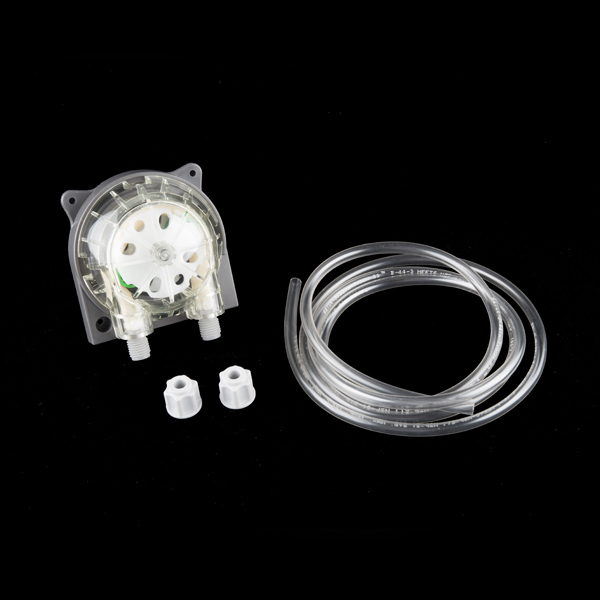 This peristaltic pump works through positive displacement, two rollers are attached to a single motor that spins around a Norprene® tube pinching it closed to force your beverage liquid to be pumped through. With this method you won't need to worry about your liquid flowing through any moving parts, it will bypass the need for flow meters, and you will be able to meter the amounts of beverage liquid independent of viscosity and density. 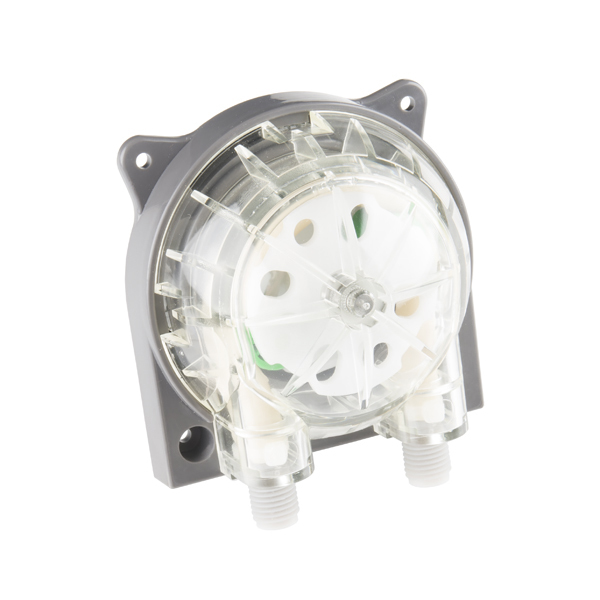 Unlike most peristaltic pumps, the Bartendro Dispenser comes equipped with a controller board (driven by the reliable ATMega168), RJ45 and liquid level sensor connectors, and even a few WS2801 RGB LEDs just to make your drink provider all the more pretty. The only things that the Bartendro really need to get going is a bit of motor power (minumum of 12V, max 24V), logic power, and serial communication all of which are supplied over the RJ45 jack found on the back of the board. Basically all you need to do is form a serial communication with this board via Arduino, Raspberry Pi, pcDuino, or any other development board of those natures and you will be good to start pouring! Note: The Bartendro Dispenser is NOT intended for medical use. Is there a temperature limit for the internals of the pump? We have a project using hot water (210 F) and this looks like a decent fit. Fluid never really enters the pump, it always stays in the tubing so the pump itself is probably fine with 210Â°. 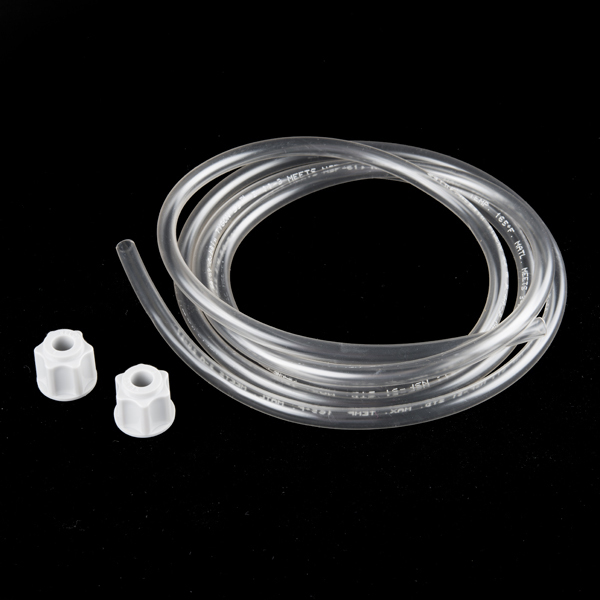 The maximum temperature for the Tygon pump tubing is about 165Â° Fahrenheit though (74Â°C) so that's really your limiting factor. Errr... Sorry, it's how much??? I concur. It's too slow to fill a full sized glass. Heck it was slow to even fill the shot glasses in the demo video. Better solutions? Gravity + stainless solenoid valve. (non-pilot else it won't work since they have a minimum pressure requirement and it can't be brass because those usually contain trace amounts of lead, which is way too dangerous to risk) Or.... use the sparkfun vaccuum pump (which can also pump pressure) to pump pressure into the top of the bottles to pressurize and force the liquid out through a second tube that goes down to the bottom of the bottle. Peristaltic pumps are too noisy and slow for an efficient bar-bot. Definitely the easiest method, but not the most elegant, slick, or quiet. Same here. I have gotten some nice beefy gear motors from Pololu. 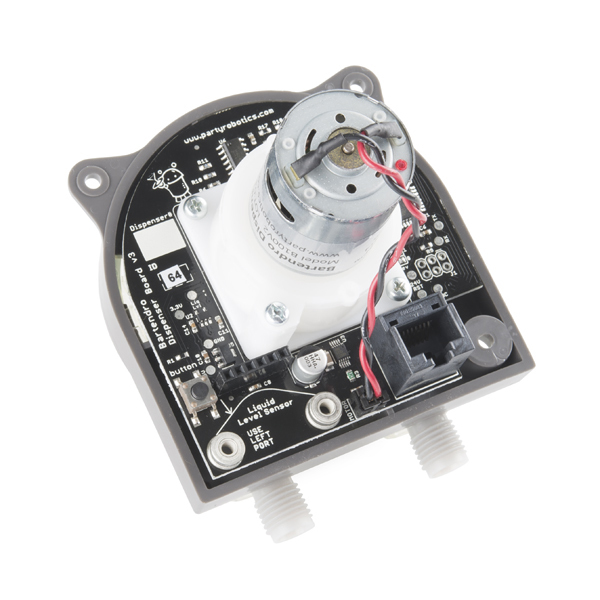 They also have drivers, controllers, encoders, etc. Did you get the pump to work with arduino? What should we be looking for? A chemical reaction with the tubing? My cursory search on "Alcohol Safe" did not turn up much. Neat system in your link! Wouldn't the CO2 system carbonate the drinks? If I remember correctly maintaining ~2atm is all that is needed. And that pressure drops with temperature. Casey, not sure if this is still relevant to you six months later... but in general when specifying something like a polymer for a peristaltic pump you should be looking for solvent compatibility. Many polymer suppliers will have tables that give at least a general ideal of whether something is suitable for use with a particular fluid. They often come with caveats, however, like the operating temperature. Frequently any tests conducted were probably a room temperature. Sometimes you might have to worry about a chemical reaction, say if you were pumping something like concentrated sulfuric acid. In the case being discussed here, the alcohol is likely just acting as a solvent. Hey Casey - Alcohol is a pretty aggressive liquid and will leach unwanted chemicals out of plastic tubing. FDA 21 and NSF 51 only cover booze containing less than 15% alcohol. Itâs pretty difficult to carbonize a liquid; it requires higher pressure and temperatures near the freezing point. In most fast food joints theyâll utilize âCarbonatorsâ and large aluminum âCold Platesâ to carbonize the water thatâs mixed with their soda syrups (check out soda supply websites for an example setup). I have some experience with this type of pump in prosthetics R&D. I use it in a manikin to deliver fake sweat at a precise rate. This type of pump is also used as a vacuum pump in prosthetic applications. The pump is so simple to build that it hardly seems worth the price quoted here. I don't see much added value in the processor, motor driver, etc. since you can get them for 20 or 30 bucks. Not that hard to calibrate it using an 8 oz. coffee cup, since it's not lab grade anyway. So that's a total of $46 material costs (less shipping)... If you can build the pump in one 6-hour day and your time is only worth $14/hour... you'll break even. ...except that your pump won't have an encoder and will pump at a max rate of 1/7 the speed of the Bartendro. I'm not saying you can't do it, but if you do then get in touch with us because we might sell it. And I say that only as someone who had the same reaction as you. I want to build a lead free solder paste dispenser using this pump. The idea is to avoid compressed air. And to dispense exact ammounts of solder paste in an automated process. Looks like viscosity is not a problem so, do I give this a try? I think I will stick with this http://www.adafruit.com/products/1150 $25 one from adafruit. They are very different. The adafruit one won't do 'dosing' without some work. Ours has an encoder, so you can precisely pump liquids. Say you want 3mL, you can easily dial that in, and get exactly that. With the other pump, you would be at the mercy of just having it turn on for a period of time and turning it back off again, and it won't dispense a precise amount of liquid. Neither. It should be 6mm OD / 4mm ID. This pump is actually the WP1100 from Welco, and it should be the WI6 fitting type. You'll see that the pictures of the compression fittings in their guide, matches the compression fitting on the WI6 type on Welco's site. same function at less than $4. That would be more a part of this than a comparable product. Almost the same thing only at a 1/12th of a price. I don't think you understand... This device is designed to dispense extremely precise amounts of liquid... not measure liquid flow. 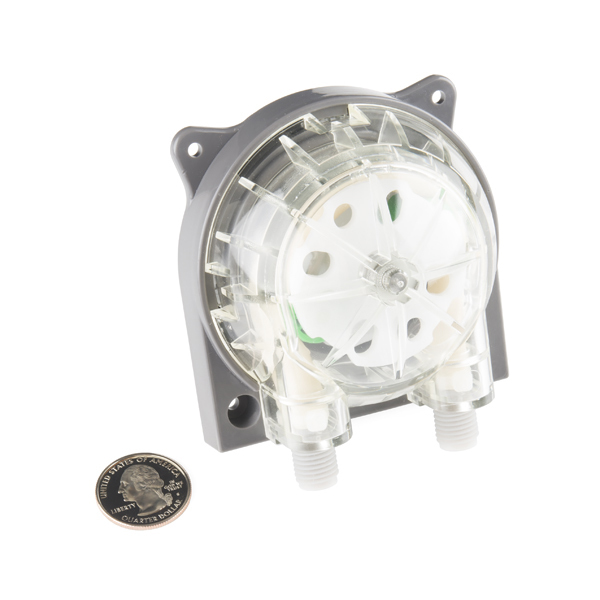 A flow meter and a peristaltic pump are "almost the same thing"? If you define all pumps as being the same I guess. But it's like saying all people are the same. Not exactly a fair comparison. This pump comes with the driver, a micro controller, and some software pre-loaded to meter dispensing. And this is made of Food safe hardware. Granted, but the only "food safe" part is the tubing. Also, see my comment above about the additional parts and software. I figure the additional parts would only be $30, so you'd still come out ahead. OTOH, there's some value to getting a working setup. OTOH, thereâs some value to getting a working setup. Bingo. Sometimes it's more fun to work on other aspects of the project. Consider this a "short -cut" This pump is also much faster that the smaller pumps. Looks nice, but its flow rate seems to be at most 18 ml/min. Perhaps for watering plants.. This Bartendro looks like it has a Welco WP1000 pump as the pump mechanism (http://www.welco.net/wp10a_e.html). These cost US$100 per pump (directly from the manufacturer in Japan) so this system with a built-in controller is a pretty reasonable price. The welco pumps are available in a range of different motors, fittings and pump tube diameters including stepper motors and smaller tubes. I bought a couple with 24V DC motors for a wash water pump at work and they seem to be good quality. Watch the video, and think about replacing the human finger with a servo, stepper or solenoid. If you're interested in that pump design, please comment back as I have the means to fabricate them for you (super, super inexpensive). You should consider used medical infusion pumps assuming they would meet your accuracy/rate requirements. Dual units can be had for CHEAP. Cons: - The biggest thing by far is the lack of documentation on communicating with the board (especially troubleshooting). If you don't use an Arduino (we used a TI micro controller) and the expensive router board, be prepared to spend quite a while hacking together some code to make it work. - Pumps pretty slowly, even at max speed. - Expensive.